Stems: erect, 6 - 24 inches tall, covered with stiff hairs, and contain a milky juice. Leaves: emerge from base without petioles (the slender stalk by which a leaf is attached to the stem), simple, covered with stiff hairs. Roots: fibrous with slender stolons (prostrate stem, at or just below the surface of the ground) running along ground, roots at nodes (a part of a stem that normally bears a leaf) of leafless stems, composed of only conspicuous orange-red ray flowers, bloom June -September. Seeds: about 1/16 long, dark brown or black, cylindrical, elongated, covered with longitudinal ridges, with a thin tuft of hairs at least twice the length of the seed. Seedling: Seed leaves are tiny and smooth with almost no leaf stalk. Subsequent leaves are increasingly larger, emerging one by one on alternate sides. Both leaves and leaf stalks are covered with hairs. Leaf stalk is grooved. Stem is not apparent; leaves emerge from the base of the plant. Herbicides: Treat with picloram + 2,4-D; clopyralid + 2,4-D, or dicamba + 2,4-D before bloom. Pasturelands must be healthy to recover from vinfestations and treatments, so fertilization is important. biological agents are available for the hawkweeds. Backround: Orange hawkweed is native to Europe. Distribution of this weed has likely been assisted by flower enthusiasts due to its beauty. The attractive, scarlet-ringed, orange blossom belies a highly destructive potential. Orange hawkweed spreads by seeds, stolons, and rhizomes, and can invade many different habitats including urban sites, meadows, pasture, hay fields, roadsides, tree plantations and riparian areas. It forms extensive mats that practically eliminates other vegetation. Distribusion: Orange hawkweed is found in many eastern states and also from western Washington to Wyoming. There are several small outbreaks on the Clearwater National Forest, almost all occurring along roads. Generally the species is increasing where found. Bibliography 1. Henry, Charlie, Colorado Weed Management Association. [online] available: November, 1998, http://www.wellesley.edu/Activities/homepage/web/Species/phawkweedo.html. 2. James, Jeff, Field Bindweed. [online] available November 5, [online] available: 1998. http://www.agf.gov.bc.ca/croplive/cropprot/weedguid/orangehw.htm. 3. British Columbia Ministary of Agriculture and Food, [online] available: http://www.agric.wa.gov.au/progserv/plants/weeds/hawkweed.htm, October 4, 1999. 5. 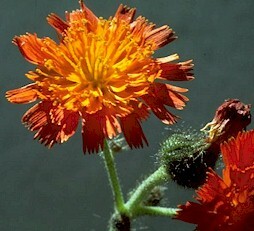 Nova Scotia Noxious Weeds, [online] available: http://co.laplata.co.us/weeds/Orange%20Hawkweed.htm , May 26, 1997.